1 Blemished Available: $53.97 This item is available as a Blem/Refurb. These are items that cannot be sold as "New" merchandise and are limited to stock on hand. See the product details for a description of the product's condition. Large eyeport for improved range of vision. a very nice fit and the sun shelter works very functional but you need a goggle for the wind. When I first rode with the helmet, it was very loud, and the visor was rattling. Since then I have bolstered the cheek panels out about 1/2 inch, and changed the visor to an old one I had from an old helmet. Replacement cheek panels would not have been thick enough. I had to make my own. Now the noise is down, and the helmet performs like it should. 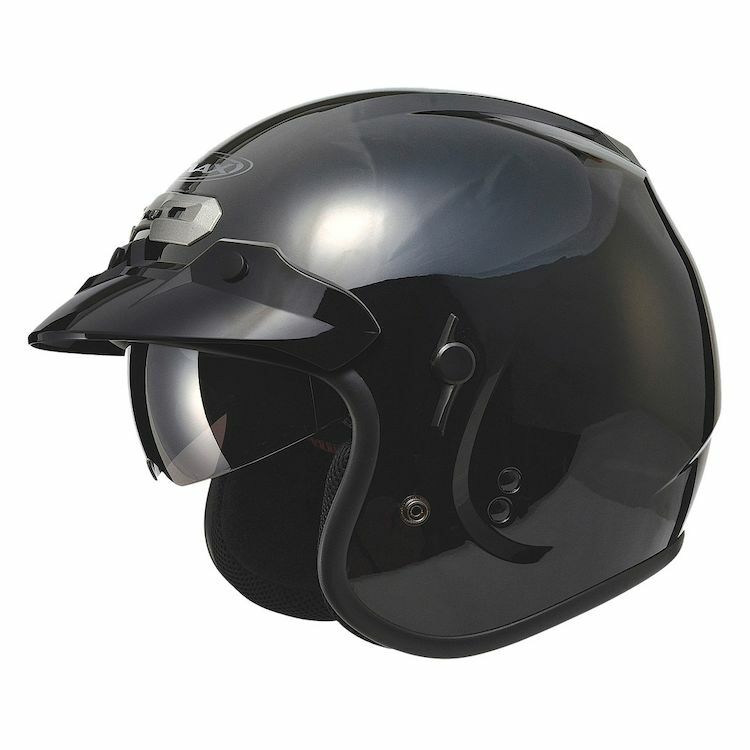 This is a very good quality helmit for the money. This is the second one that I've purchased. I like this helmet quite a bit. I got it because it came in a 3X and it was for a good price and it has a pull down visor. That's where the problem is. The helmet fits great; however, the visor positioning is all wrong for me. It won't go over my glasses, and when I don't have them on, they cover only half my vision. I like the helmet, but a big part I was looking forward to was the visor. Since it's all wrong, it receives a 3 out of 5 for me. This is a nice lightweight helmet to take on the fly and not worry about it getting pinched. I like the flip down visor feature. In fact I would have gotten a rock to the eye if I didn't have it down one day riding. It's very loud almost like a 1/2 helmet but that could be because the fit is slightly large. The main reason I purchased this helmet,was here in Oz,it's very hard to find a XXXL. Also I liked the idea of a concealed visor,however as it is not adjustable,it's a horrible fit for me. I had read similar reviews and although our $$ exchange rate is poor, I thought I would take a chance. For your local market at this low price,she is good value and reasonably comfy. It's probably overkill for an old electric scooter driver to have this kind of helmet when a bicycle helmet would do ( 20 mph max in quiet neighborhoods), but I liked the extra insurance, features and comfort it provides. Oh...the color matches the scooter also. Great helmet and fit instructions were perfect! Love the helmet. Fits perfectly based off sizing chart. Wind noise is minimal and the price and quality are great! Wanted a 3/4 helmet with a visor, and flip down sun shield. Fits my requirements exactly,visor,sun shield and 3/4 open face. alota bang for the buck. It is what I was looking for. Neded a helmet with a little more side protection for the wife. Can a communication devise easily be installed on this helmet? Enough room for speakers to be mounted? BEST ANSWER: Yes, my SENA 20s fit just fine. You will have to try a few different earpiece locations to find one you like so it's comfortable and you can hear well. what shape head does this helmet fit, ie. round oval, intermediate oval? I where glasses, does the sun shield have clearance enough to clear them without touching my glasses? BEST ANSWER: I wear glasses also and to answer your question, the shield bumps my glasses frames when I let it down. I can move the helmet a little and clear my glasses but to be truthful; I think you could do better. Other than that; the helmet has been fine especially for the price. It is close when you flip it down but clear in the down position. Yes, I wear prescription glasses and sunglasses and they clear fine. Will outer shield fit on this helmet? BEST ANSWER: It looks to me that it will. There is ample room in the cavity for the ears, but I do not Have an intercom system. Best o can do you, helmet is comfortable and the visor works well.